The disastrous 1957 “restoration” of the Codex Eyckensis using adhesive foil caused serious damage to the manuscript: the parchment was attacked by the acids formed in the foil, became dark brown and brittle. At the end of the twentieth century a decision was made to remove the Mipofolie laminate and where possible to repair the parchment using a dermal tissue preparation (“parchment pulp”), with the aim to at least stabilise the damage done. Twenty-five years have passed since the Codex Eyckensis was saved from the Mipofolie laminate. The time has come for a new assessment. Prof. Lieve Watteeuw (KU Leuven, Illuminare, Book Heritage Lab) and Marina Van Bos (Belgian Royal Institute for Cultural Heritage (KIK–IRPA)) will examine and study the manuscript. For this reason, the Codex Eyckensis will be moved to the University of Leuven (KU Leuven) and the Belgian Royal Institute for Cultural Heritage (KIK–IRPA) from the second half of 2016 until the end of 2017. Prof. Lieve Watteeuw will study the Codex and examine whether its condition is still satisfactory. She will compile an exhaustive report on the state of the manuscript, to enable other scholars to monitor its evolution. In addition the techniques and pigments used by the miniaturist will be mapped out and recorded. For the purposes of this research, use will be made of a 3D video microscope and the multispectral microdome (RICH Project – Illuminare), a scientific 2D+ imaging technique. The methods and equipment used enable the researchers to zoom in on the folios from different points of view, thus making it possible to discern even the thickness of a line of ink. The Mipofolie laminate that was removed in the course of the previous restoration, has been kept at the Belgian Royal Institute for Cultural Heritage (KIK–IRPA). New equipment has now become available, which can be used for non-destructive laboratory analysis of the pigment residues that got stuck to the laminate. In this way, we shall learn more about the pigments used by the scribe. Comparative analyses will tell us more about the origins of the various pigments and may even provide further information on the location where the manuscript was made. This place of origin will most likely prove to be the scriptorium at the Abbey of Echternach. In 1994 professor Nancy Netzer (Boston College) published the results of a comparative study of three eighth-century manuscripts: the Codex Eyckensis, a Gospel Book from the treasury of Trier Cathedral and a Gospel Book from Augsburg. These three manuscripts share a conspicuous number of style characteristics. The manuscripts held in Trier and Augsburg can clearly be linked to the scriptorium in Echternach and to the scribes Thomas and Vergilius who worked at the scriptorium. The Codex Eyckensis will continue to yield up its secrets, and increasingly advanced scientific methods will allow scholars to continue to explore this fertile area of research. In coming years, the researchers will work together with experts from universities in Belgium and abroad. The ongoing research has been made possible by the following partners: The University of Leuven (KU Leuven), Illuminare – Centre for the Study of Medieval Art (KU Leuven) and the Faculty of Theology and Religious Studies (KU Leuven), the Belgian Royal Institute for Cultural Heritage (KIK-IRPA) in Brussels, the King Baudouin Foundation, the fabric committee of Saint Catherine’s church, the Municipality of Maaseik and the Dutch company Ap-art B.V. (MT-K information kiosks). The saints Harlindis and Relindis have played a key part in the spreading of the teachings of Christianity and the written word in the Maasland region. 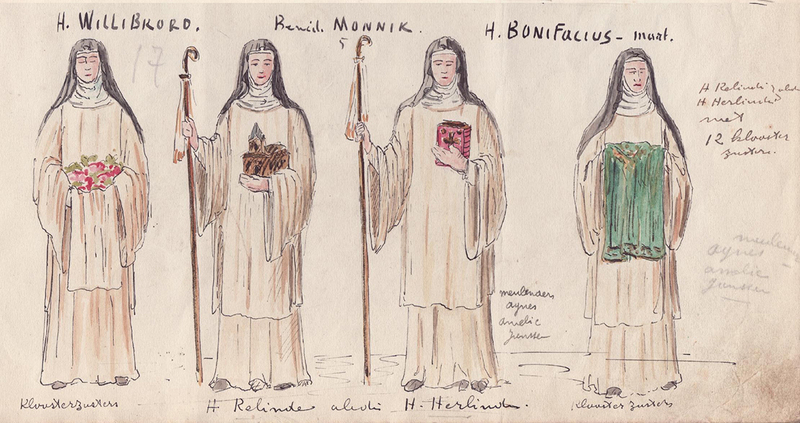 Through the centuries, the people of Limburg and Liège have continued to venerate the saintly sisters. In the course of the ninth century their sarcophagi were moved to the new stone church that had been built to replace the wooden church built by their father in 719–721. Soon a cult developed, centred on the saints’ relics and the manuscripts. In the year 1388 the first festive procession was held, in which the relics of Harlindis and Relindis and the Codex Eyckensis were carried from Aldeneik to Maaseik and back. Later the annual procession was replaced by a septennial procession. In the aftermath of the French Revolution, the procession was no longer held. In 1847 the tradition was reinstated, with the procession now held at 25-year intervals and still including the display to the general populace of the Codex Eyckensis and the Anglo-Saxon textiles from the heritage of the saints. The next procession is to take place in 2022. 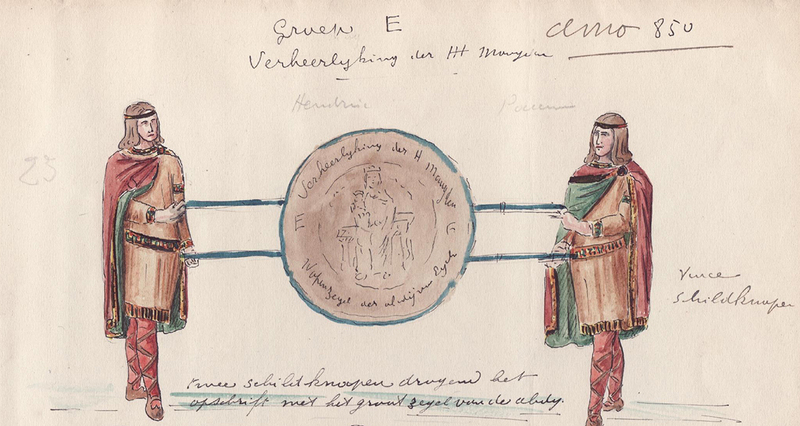 In 2016–2017, historian Katrien Houbey will make a detailed study of the veneration of Harlindis and Relindis. The results of this research will provide the basic material for the narrative which will be used to make the heritage of Harlindis and Relindis and the treasure of Saint Catherine’s church more accessible to the general public.